Oh Apple Configurator, I will not be defeated!! As I’ve said many times this year on this blog, I’m more of a pedagogical user of software rather than a technician but being the resident Apple man, I was given responsibility for the iPad program at our school. I set up the trial iPads this year using iTunes under one shared account while we went about trialling the wonder tablet in our classrooms. At that stage, the Volume Purchasing Program was not available in Australia and Apple Configurator wasn’t available. Now that both are and we are on our way to purchasing a large new batch of iPads to add to our current sets, I have finally bitten the bullet and rushed headlong into being a Technician in charge of iPads. I was disappointed in the lack of clarity in the Configurator manual and online help from Apple and I did a lot of fruitless searching for answers to my initial questions about Configurator. In the end, I decided to trust my level of understanding of Apple software along with my propensity to experiment and persist and just go ahead and try it out. Initially, I was very happy with the basic idea behind Configurator and found it very simple to use until a major flaw, that unfortunately I’ve have decided to accept (more on that later) showed its ridiculous self. The Prepare function was very simple to work out. You simply plug in the iPad/ iPads ( to start with I just plugged in a single iPad but eventually I did 7 at once; apparently 30 can be done if you have a big enough hub) and then create the settings and select the apps you want installed. Options for restoring from a specific backup or updating or ignoring the IOS to install on the selected iPad. You also can decided to automatically name the ipads sequentially by number if setting up a large number from scratch. I chose not to do this as I was reformatting iPads already allocated numbers in our records. The main setting to adjust is the profile. To create a profile for a set of iPads ( you can create as many as you want – I’ll be creating a separate profile for the leadership team’s devices), you simply click on the + icon at the bottom of the window. This brings up the window shown below. Wi-Fi/Global HTTP Proxy : set the type of network, password, network ID and proxy server. An improvement on iTunes, which although it saved settings through a backup restore, still needed the password to be entered individually on each iPad. Mail Settings: this allows you to set up a mail account with all required settings, similar to the iPad set up but applied to all iPads seamlessly. Certificates: Our system now uses zScaler cloud based filtering and web monitoring and this was installed by simply importing the downloaded certificate in this setting. 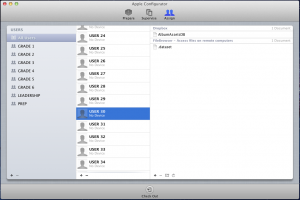 A Configurator certificate is also installed by default when in supervised mode. While this seemed simple in theory, in practice, I had several problems with the certificate being verified after installation. I had to refresh iPads several times for this to take effect – Annoying glitch you need to look out for. Two options that were more work than they should have been were the Calendar and Contacts. They require access to Calendar and Contact servers instead of just syncing with the Calendar and Contact apps on the Mac. While I didn’t need to set up a calendar on a student iPad, I did want to add teacher email addresses to the Contacts app so they could email work to teachers if necessary. To work around this, I needed to save a vCard with all of the addresses and email it to the iPad’s email account. Then I could install the addresses on the iPad. I only had to so this on one iPad, save it as the new backup and then restore all the remaining iPads from that backup. Workable and unnecessarily time consuming when the Configurator app could have just accessed the Address Book directly. Web clips can also be installed if you want to add links to school websites or other sites. At this stage, I haven’t tried that option but may in the future. Other options like VPN, Exchange and other Enterprise level settings are there but probably not needed in most educational settings. I’ve read on some sites that some have a preferences for making multiple profiles for different settings so you can just select/deselect options if you want to make changes but I prefer to have all settings in a single profile. Once the profile was set, it was on to the Apps. Again just click the + icon and you will be taken to your iTunes library and the Mobile Applications folder. Simply select the apps you want to install, and they will be imported into Configurator’s Apps panel. If an app is free, it will be labelled as free and can be installed on as many iPads as you want. If it is a paid app, a grey rounded button appears next to its name with a 0 in it. This is to signify it can’t be installed until you have purchased codes from the VPP ( Volume Purchasing Program ). Once you do purchase codes, you simply click on the grey button, locate and import the spreadsheet of codes and the number of codes show up on the button. Simple to use and understand. Then it is just a matter of selecting the apps you want to install and clicking Prepare. The program then installs the most up to date iOS, all of the settings and apps while you go get a coffee. The time it takes depends on whether you already have the latest iOS on the iPad or not. Today, when I set up 14 iPads in two sessions ( I only have a 7 port hub) it took about 50 minutes to complete 7 iPads but they already had iOS 6.01 on them. After I set up the initial iPad, I backed it up so that I could restore all the folder settings, addresses, Dropbox and FileBrowser settings to all the other iPads. This is an important step if you want all of the iPads to be identical. Once a backup is saved, you switch the restore option to that specific backup and all the other ipads will be restored to that setup. Once prepared, you are ready to use the Supervised Panel. 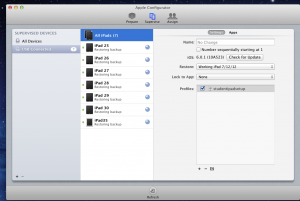 This is where you can make changes throughout the year to individual or groups of iPads simultaneously. You can remove or add apps, change profile settings, update iOS, make new back ups or change the name of the apps. The main benefit of the Supervise function is that when you remove paid apps from supervised iPads, the code is transferred back to the system and can then be used again on another iPad. This is a great function to have if you want to save money by only buying VPP codes for some of your iPads and switching them from one set to another. The final function is Assign. I had no plans to use this function until I discovered the one MAJOR FLAW in supervising iPads. Once the iPad is under supervision by Configurator, it can no longer be connected to another computer in order to download photos or movies from the Camera Roll. This is a feature that is certainly NEEDED in a SCHOOL where one of the MAJOR FUNCTIONS is using the creative power of multimedia apps that can be saved as images or movies. What was Apple thinking here? When I discovered this, I was going to give up on the SUPERVISED option and go UNSUPERVISED. However, this caused a lot of heartache. The profiles wouldn’t work, once an app was added, the code couldn’t be transferred, and worst of all, once the iPad was set up, you couldn’t add or delete apps through Configurator. So I had to make the compromise and decided we would have to rely on wi-fi transfer of photos ( easy ) and movies ( slow but possible) using our FileBrowser set up. Hopefully, though, Apple will change this flaw if it is serious about school use. Anyway, back to Assign. With Assign, you can create users and assign them to groups and iPads. This meant you could check out the iPad to a user and when it was checked back in through Configurator, you could download work from any app that has iTunes Sharing as an option. Not ideal with potentially 100 different students wanting to access files on ONE computer but a last resort. Having said that, while I haven’t set them up yet, Assign is a nice way to sort the iPads into groups for each grade level, which will happen next year with more iPads being available. One of the main reasons I wanted to use Configurator was to find a simple way of managing the iPads. Using iTunes meant a lot of work arounds to get the iPads set up this year. When I eventually leave one day, I want something that a novice can take over without too much hassle. iTunes wasn’t going to allow that to happen with 100 iPads. Despite its glitches and that ONE MAJOR FLAW, Configurator is an easy to use ( once I worked it out) program that I can explain to someone else. I also have one gripe with the VPP. You only get the codes, not the app. You have to download the app from iTunes using one of the codes, then add it to Configurator and uninstall it to retrieve the used code back ( so I have read, anyway)Not good, Apple. Set up the VPP as a download store as well please.Fortunately, I had copies of all the apps already so I didn’t have to go through the hassle but for others it would be a pain. I know there are other management programs out there and its Mac Only but with Configurator being free, it seemed the best option at the time. I wish it would work wirelessly ( apparently it can with Lion Server, which I don’t have) but overall, I think it is a serviceable program for what we will probably maintain in the near future. If anyone has any questions or other tips or alternatives I’d love to hear them. There is no end to the uses of the iPad in education. I’ve discussed that ad nauseum on this blog. As a learning tool, it has the potential to make a great positive change to learning. The only problem is Apple designed it for individual use. Schools are designed for ( or budgeted for) shared use. 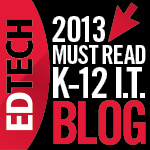 Conventional wisdom is for iPad use to occur in a 1:1 or BYOD Environment. In the best case scenario, I wholeheartedly agree. Unfortunately, financial realities will often dictate that sharing is the only viable option if we want our students to enjoy the benefits of the iPad. It can be done effectively – I’ve shared my thoughts early in the year about the pros and cons of shared iPads – but doesn’t happen without some time consuming workarounds. What follows is my take on the pains (and remedies) of sharing iPads in a rather large Primary (elementary) school. If you have your own iPad, privacy, safety and security boils down to deciding to use a passcode to lock your iPad screen and, if required, being connected to your school’s network filtering system. In a shared iPad environment there is a truckload more of procedures, policies and effort involved. In our situation, the iPads are mainly for the students but I have assigned each of the iPads to a teacher for overnight borrowing. This allows them the opportunity to explore the preinstalled apps and experiment with how they can use the iPad in their classes. With the iPads being shared with students from Prep to Grade 6,though, we need to be careful with what teachers leave accessible on the tablet. Because of this, we had to adopt a borrowing agreement for teachers to sign. It covered accountability for damage, stipulations that all work done on the iPad be removed, limits on sites visited on the browsers, and most importantly, returning it the next day so the students can access them. The restrictions have limited the borrowing by teachers during the year, especially the need to clear them of all work. Getting teachers onto options like Dropbox, which is accessible through most of the apps we use would alleviate the pain, especially now that it is finally working at school, but that’s another PD program in itself. Our school has had issues with using a proxy server with iPads since we’ve had them. With multiple users trying to log on to the internet using their own secure username and password, we had issues with Safari staying connected to accounts and apps randomly trying to connect to the internet via repeating login screens. We have recently switched over to ZSCALER which not only has solved the proxy conflict with most apps, most notably Dropbox and Evernote, but has also made accessing the internet with multiple users more secure. Each time a user has log on since ZSCALER, there has been no issue with Safari staying connected to a particular user’s account. However, a new issue has arisen, albeit with a solution already worked out. ZSCALER works with an initial log on via a designated username and password per computer. This works well on computers that allow for individual user accounts. 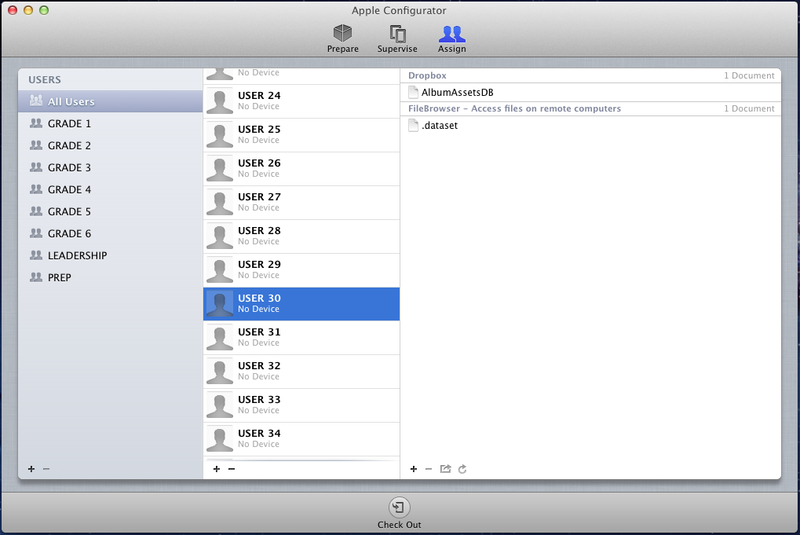 The problem with the iPad is that there is a single user set up , not logins. This means that whoever logs in to ZSCALER on the iPad first stays connected to their ZSCALER permissions. Even though each additional user can log onto their personal internet account, their access is dictated by the permissions of the first user. This is fraught with danger if the first user is a teacher with full access and then a Prep student gets it and no sites are blocked!! The intial workaround is to go into Safari settings and clear the History and Cookies. This resets ZSCALER and allows for a new login. The problem with this solution is that we don’t want the students messing around with settings. 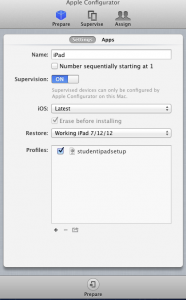 What we’ve decided to do is create a single student user account that contains all the permissions appropriate for students and login into all the iPads with that as a one off. Then they can be left alone. Teachers will have to live with the restrictions. One successful remedy we have working consistently well is accessing the school network. Using the iPad app FileBrowser, which I outline in this post, everyone can log on to the network and access their files, which can be opened on the iPad if a compatible app exists. With most apps accessing FileBrowser through the Open in… function, users can also save their work back to the school network. The added bonus of FileBrowser is that it can access the iPad camera roll so any image or movie saved by apps there can be copied to the network through the app. The only issue is making sure everyone logs out of the network when they finish using Filebrowser ( this involves a simple click on an electric plug icon). This is one success story with sharing iPads without any lasting issues. The most obvious problem with sharing iPads, and yes I know it has been discussed at length on countless iPad flavoured blogs, is the lack of file system and autosave/store within app functionality of the iPad. It’s great for its original purpose of easy access for the intended individual use scenario. For shared environments, it creates a mountain of files stored by potentially hundreds of users. Will other users delete/ overwrite or edit the file? Will we run out of storage space because of the number of photos, movies, animations, comic strips, documents, drawings, ebooks etc floating around all those apps waiting to be completed? Again, all of this can be dealt with through a number of file sharing or transferring methods. I’ve already mentioned the successful use of FileBrowser. Dropbox or Google Drive access is another good option, emailing files is often used by those less adept at using newer methods. The biggest issue is consistent adoption of these methods. Often students and teachers save their work to one of the above options but still leave the original copy on the iPad. This leads to a build up of files that no one is certain are safe to be deleted. It will take time for everyone at school to get into the routine of transfer then delete, but it is a workable solution. Funnily enough, for many at school, the biggest issue of sharing has nothing to do with the limitations of the technical side of the iPad. It’s simply the access to them. At present, they are stored centrally in one place in a set of carry trays. For some, and it is a reasonable complaint, it is difficult to carry them across the expanses of our rather large property to their class rooms, especially the juniors who can’t rely on the little ones to help carry them. On top of that, some still find it a technical chore to use the online borrowing system I have devised. And of course, 35 iPads for 760 students ‘aint’ exactly 1:1! Having brought up all these issues, though, doesn’t downplay the successful use of iPads that have taken place this year. Many videos, ebooks, slideshows, digital stories, audio recordings and comics would not have been made without their introduction. Junior grades without the widespread access to other technology enjoyed by the senior grades have been given greater opportunities with ICT as a result of the iPads. Engagement in learning has undoubtedly been enhanced. With plans for more, access will become less problematic. With our proxy server issues over, we can set up cloud options for transferring files and continue to improve in our use of FileBrowser and deleting files when finished with them. We will always be a shared iPad environment. We will make it work. What stories do you have of your shared iPad experiences. Please leave a comment to let us know. Join the conversation. School iPad Program – not as easy as I thought! One term into the official launch of our iPad program, I thought it would be opportune to reflect on the successes, failures and everything in between. I have to admit, as a self professed, but not certified, iPad/Mac “expert” and ‘All Things Apple’ zealot, things haven’t gone as smoothly as I’d hoped. I would like to blame it all on our proxy server, but I suspect Apple has something to do with it too. I set up our iPads before Apple’s Configurator software for managing iPads came out. Regardless, the initial set up was pretty smooth. I set up the base iPad configuration on a targeted iPad and backed it up to my dedicated Mac Mini iPad machine. (Last year, when we trialled a small set of iPads with teachers, I was stuck using an Acer PC Laptop. Windows + iTunes + iPad ≠ smooth management. I strongly argued for a lone Mac to maintain my sanity in dealing with our iPad setup this year.) I set up all the apps in designated purpose built folders, created the school network connection, connected to iCloud, configured the network app FileBrowser to connect to our school network so we could access files and thought everything was ready to go. The hassles came in the weeks to follow. Due to a lack of forward thinking on my own behalf, there were several configuration set ups I didn’t think to do on the base iPad “image”. It was only when the iPads started being used and teachers and students wanted to email documents that I realised that I had not set up an email account on the iPads. Orginally I hadn’t considered it because of the perceived hassle of everyone wanting to use their own email on a shared iPad. That wasn’t going to work. 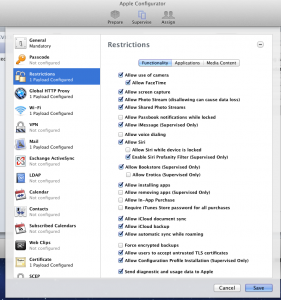 However, we still needed a system to email work in apps that didn’t support other solutions. In the end, I set up a dedicated account in our school internet-based mail system just for the iPad ( with my account as the forwarding address in case inappropriate mail was being received) so that anyone could SEND emails to their own accounts to be opened on other computers. I also soon realised that I had inadvertently set up the FileBrowser app’s network access and the Edmodo app under my name so that any user on any iPad was logged in as me! All these settings had to be individually changed to fix that obvious security hole. Fortunately, I solved this quickly through the use of my newly appointed Student ICT Leadership team who spent an hour with me changing all the settings. Before you worry about the handing over of responsibility to students, none of this required providing sensitive information to them. I actually recommend training up a small group of students to help with non-critical management that doesn’t need passwords or the like – they’re easier to train than most adults as long as they are trustworthy, which mine are under supervision. They have also helped me with setting up numbered wallpapers for better identification, folder creation and maintenance and other simple management tasks. The next issue to arise is the updating and installing of new apps and system updates. 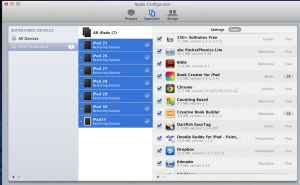 Originally, I had set up the iPads to sync and update wirelessly so that I wouldn’t have to manage that constantly. Unfortunately, I found this too be less than ideal for a number of reasons. I’m not sure if it was because of our proxy server being mean to iTunes, the wifi being overloaded and inconsistent or a combination of both but I could never get the iPads to consistently sync. Some iPads would end up with newly purchased apps automatically installed while others wouldn’t. Some iPads would backup and update apps while others would deliver error messages to iTunes. Often, someone would open up an iPad to use an app they had previously used to find it in a longstanding waiting to update state, rendering it unusable. Then the emails from the Office complaining about the bills for exceeding our monthly downloads started coming. So I went back to physically connecting the iPads to iTunes and manually syncing for app updates and loading of new apps. This has proved to be less problematic and allowed me to keep all the iPads consistent in setup. Having said that, with the number of apps I have loaded on iTunes , the download limit for the school is still being exceeded and I’ve resorted to taking an iPad home and updating there with my unlimited iTunes download account and then syncing the updated apps back to the Mac Mini at school. This is clearly not a viable long term solution as I won’t be around at the school forever and my home account can be relied upon as a management system. My ICT leader just informed me this week that the download cap issue is being fixed so that is one problem solved for us but is still a consideration for others to deal with . Just as frustratingly problematic has been upgrading the iOS system software. As soon as I had set up all the iPads at the start of the year and rolled them out for use , the 5.1 update was released. Sometimes in schools, upgrade cycles are delayed because the benefits of upgrades are outweighed by the hassles of interrupting the workflow of others when dealing with a large scale deployment of devices. From personal experience, though, upgrading iOS was a walk in the park so I decided to do the upgrade straight away. Apple’s own upgraded apps wouldn’t work without the update anyway. Well, again, not sure if it was proxy problems or trying to manage too many devices from a single computer but it wasn’t smooth sailing. Waiting for each iPad to install, load and restart before the next update cycle for the next iPad could begin meant a lot of wait time. iPad management is not my full time job so this was a time issue that could effect teachers in other schools who also become the iPad person. Occasionally updates would fail and you would have to start again. Once or twice, I’ve discovered one or two iPads in a set not up to date. For some reason, again possibly the proxy server problem, I couldn’t update wirelessly so I’ve just taken them home to run the update. As I mentioned earlier, I haven’t used Apple Configurator software yet because I haven’t had the chance to interrupt the workflow of iPad use to reconfigure the whole set up. Reading some reviews, it seems to be a good solution so will see how that goes at end of year when I reimage and set up for 2013. Once all the setup hassles have been tackled, I can at least report the general day to day usage has run smoothly. In our case, all the iPads are centrally stored in one locked cupboard in my office. I set up a borrowing system on GoogleDocs that the teachers use to book out sets of iPads for timetabled sessions. We have five sets of 7 iPads in transportable kits. Instead of spending money on expensive sync carts, we decided to buy dish washing racks from the local hardware store and attached a powerboard to each rack. The iPads fit snugly in the racks and can be easily carried from office to classrooms. There are teachers who don’t like the hassle of “collect and return” but for charging, syncing and security reasons, we want all the iPads in a central locations at the end of the day. Each iPad is also assigned to an individual teacher so they can take one overnight or on weekends to explore. They have to sign an ipad agreement before this happens to ensure due care is taken. There have been occasional care issues with the return of the sets. It would be nice to see teachers take the extra 5 minutes to ensure the cables aren’t tangled or crossed over and the iPads are put neatly back in the racks. There was a suggestion that the iPads should be available to only the junior grades since the senior grades had access to so much technology and the juniors didn’t but I pushed for a trial period of P-6 access. I didn’t want the situation of 35 iPads sitting idle waiting for the juniors to use them while the older children were hanging out for a chance to get their hands on them for valid reasons. As it stands, everyone is using them fairly consistently and there are still days when some sets don’t see the light of day. 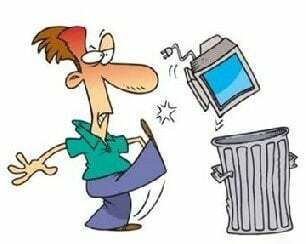 More training sessions are needed to showcase their potential use, Once that happens more frequently ( report writing time has delayed that in recent weeks ) I’m sure we’ll see empty cupboards. After reading this you could either be doubting my supposed credentials as an iPad blogger or hesitating to tackle large scale deployment of iPads. Hopefully you won’t do either of those. Despite the hassles, the general experience has been a good one. My biggest mistake has been trying to do it all on my own. As a lifelong Apple user, I’m used to working out issues by myself but on a big scale you need support. Have a look at Configurator in the Mac App Store. Call Apple. Talk to others in the same situation. Plan. Have a clear plan for what you want on each iPad. Make sure you know what you want in terms of network settings, mail settings, apps, restrictions and so on before you set up the iPad image you want to use. Think about how you are going to manage the upkeep long term and have an organized plan for that. Do your research. Make sure you have all infrastructure in place that can manage your plan effectively. Know what your school’s Internet usage is. Know how your security setting like proxies are and how they may affect your plan. ( ICT leader has just met with new Education Office expert who informs us that new system coming will solve the proxy problems we have – double Yay!!) Know your budget and for those outside USA, know that the Volume Purchasing Program is on its way and we will need to be stricter on our app purchasing and deployment. I would love to hear from others their success stories and frustrations. This time two years ago the iPad was just a personal media device intended for individual use. In a very short time it has become a must have educational tool without a perfect system to make it happen. It’s no that simple yet.